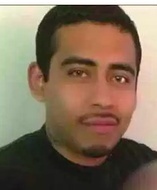 Ivan Solis, a 25-year-old Latino, was shot and killed Tuesday, July 11, in the 14900 block of Begonias Lane in Santa Clarita, according to Los Angeles County coroner’s records. Los Angeles County Sheriff’s deputies were called to the area around Begonias Lane Park about 5 a.m. after a “shots fired” report. When deputies arrived, they found Solis lying near his bicycle with multiple gunshot wounds, according to a sheriff’s news release. Solis, a resident of Canyon Country, was pronounced dead at the scene at 5:27 a.m., according to coroner’s records. Friends and family told KTLA 5 News that Solis was a good person trying to overcome an addiction since the birth of his daughter. “I tell those who have someone in the streets or on drugs, you guys have to try to get them help,” Solis’ sister, Jessica Razo, said. Eight days after the shooting, deputies arrested Nicholas Colletta, a 20-year-old white man, and Jaqueline Arreola, a 24-year-old Latina, on suspicion of murder. Investigators think Colletta issued a “gang challenge” asking where Solis was from before the shooting, Los Angeles County district attorney’s spokesman Ricardo Santiago said. Colletta and Arreola were charged with murder on Aug. 14, with the allegation that the crime was committed for the benefit of a criminal street gang, according to a release from the district attorney’s office. In addition, Arreola was charged with one count of accessory after the fact, and Colletta was charged with possession of a firearm by a felon with three priors, unlawful possession of ammunition and carrying a loaded firearm as an active participant in a street gang. Colletta is being held in lieu of $3.13 million bail, and Arreola is being held in lieu of $2.1 million. The case is still under investigation. Anyone with information is asked to call the sheriff’s Homicide Bureau at (323) 890-5500. Those wishing to remain anonymous can call Crime Stoppers at (800) 222-8477. I love and miss you so much Ivan. You were taken from us in such a brutal and totally senseless way ... the impact of which will resonate for all time and has devistated so many. — Shelly Harrloe Nov. 18, 2018 at 2:13 a.m.